I was going to write about the collapse of the Democratic Party in the Senate (thanks, Harry Reid; you too, Patty Murray), but I think I'll save that. The other news is this — the battle over water in California. This isn't a drought story. It's a story about money, power and the "next oil" — in other words, another "free" market story. First bottom line — If you live in Los Angeles or San Diego, your governor is giving your water to the growers. Because, capitalism. I'll explain why after the quote. Also, bribery. You'll see why if you read the quote. To get you started, listen to this great Chris Hayes segment. Figure 4. Decay of atmospheric CO2 perturbations. Consuming 80 percent of California’s developed water but accounting for only 2 percent of the state’s GDP, agriculture thrives while everyone else is parched. “I’ve been smiling all the way to the bank,” said pistachio farmer John Dean at a conference hosted this month by Paramount Farms, the mega-operation owned by Stewart Resnick, a Beverly Hills billionaire known for his sprawling agricultural holdings, controversial water dealings, and millions of dollars in campaign contributions to high-powered California politicians including Governor Jerry Brown, former governors Arnold Schwarzenegger and Gray Davis, and U.S. Senator Dianne Feinstein. The record drought now entering its fourth year in California has alarmed the public, left a number of rural communities without drinking water, and triggered calls for mandatory rationing. ... Nevertheless, some large-scale farmers are enjoying extraordinary profits despite the drought, thanks in part to infusions of what experts call dangerously under-priced water. Although no secret, agriculture’s 80 percent share of state water use is rarely mentioned in media discussions of California’s drought. Instead, news coverage concentrates on the drought’s implications for people in cities and suburbs, which is where most journalists and their audiences live. Thus recent headlines warned that state regulators have ordered restaurants to serve water only if customers explicitly request it and directed homeowners to water lawns no more than twice a week. The San Jose Mercury News pointed out that these restrictions carry no enforcement mechanisms, but what makes them a sideshow is simple math: During a historic drought, surely the sector that’s responsible for 80 percent of water consumption—agriculture—should be the main focus of public attention and policy. Last fall, the legislature passed and Governor Brown signed a bill to regulate groundwater extraction. But the political touchiness of the issue—agricultural interests lobbied hard against it—resulted in a leisurely implementation timetable. Although communities must complete plans for sustainable water management by 2020, not until 2040 must sustainability actually be achieved. The Central Valley could be a dust bowl by then under current trends. So that's the problem statement. Not enough water as far into the future as you can look. Now the solutions. Careful; this is even less pretty. Will the "Free" Market or Government Control Water Allocation? [A] modern capitalist economy values a given commodity only as much as the price of that commodity. Current pricing structures enrich a handful of interests, but they are ushering the state as a whole toward a parched and perilous future. The price of water, however, is not determined by inalterable market forces; it is primarily a function of government policies and the social forces that shape them. Elected officials may dodge the question for now, but the price of water seems destined to become an unavoidable issue in California politics. “As our water supply gets more variable and scarce in the future, we’re going to have to look at how we price water so it gets used more efficiently,” said Cooley of the Pacific Institute. If "price" is used to allocate water, the rich will have more. This includes billionaire farmers and farming corporations like those named in the first quote in this piece. It also includes the masters of google and the enclaves of their workers ... only. If "price" is used to allocate water use, the ones who will drink last will be the poor, just like they eat last and get medicine last in our "free" market economy. The rallying cry of water privatizers, a multi-billion-dollar global industry, is "properly priced water." When you hear that, you know the privatizers are at the door. Of Course Water Should Be Properly Priced: How Else Should We Ration Things? Whatever the charges per unit to households (adjusting, of course, to the fact that a household will want water that’s been treated more thoroughly, the costs of the pipeline network to each house and so on) the price of a unit of water should be equal over all uses. Because that’s how we then get the allocation of water to the use of the greatest value. Porter goes on to point out that San Diego is desalinating water at $2,000 per acre foot while not that many miles away farmers are lathering it on fields at an implied force of $920 an acre foot. This is crazed nonsense. Move the farmers’ water to San Diego and the world is a richer places by $1080 per acre foot that is moved. And if it’s moved from the Imperial district then it’s near entirely a pure gain in wealth. You'll hunt in vain for a Forbes mention of the social good, or the most good for the most people. Yet "properly priced water" is seen as the solution, including in an indirect way, in the Chris Hayes segment above. Relisten now that you've read this and you'll see what I mean. Did Government Use the "Free" Market to Build Tanks in WWII? The answer to that question is blindingly obvious. Of course not. The Forbes writer asks, in effect, "How else do we allocate water?" Answer: In the old fashioned way — by government telling people what to do. Yes, this is "picking winners and losers," but government will pick losers anyway if it picks the "free" (billionaire-controlled) market and hands the answer to those who will pick themselves as the only winners. There's a "free" market for labor. Do you feel free? When there's a "free" (properly priced) market for water, will you feel fairly treated, relative to, say, Stewart Resnick, the billionaire grower from the quote at the top? So the second problem, worse than the drought, is capture of the water supply by the wealthy, because drought, especially drought, is a profit opportunity of the first water (so to speak), and the wolves, those who supply politicians with their jobs and financing, are circling. 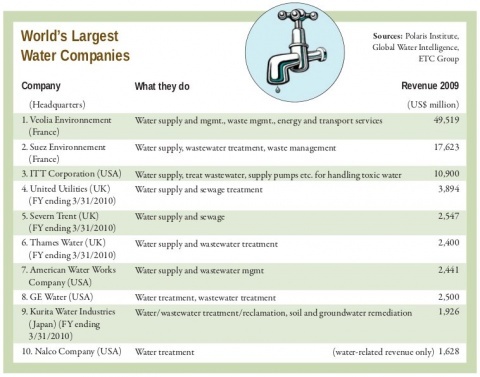 Overview: Why Invest in Water? ©2007 SUMMIT GLOBAL MANAGEMENT, INC.
… [W]ater is still abusively undervalued relative to its real economic worth, so huge room exists for asset price expansion. Combined with the vigorous market drivers, shown below, that are now becoming globally and undeniably apparent, hydrocommerce presents a very compelling investment theme for the predictable future. • Available fresh water is less than ½ of 1% of all the water on earth. 6.5 billion people now compete [my emphasis] for this finite resource, with 8 billion by 2025. • 80% of the global population relies on groundwater supplies that are dangerously depleted, if not exhausted, as they are mined beyond natural replenishment. • Pollution and climate change further exacerbate supply shortages, damaging vulnerable resources and causing drought and desertification at an alarming rate. And it gets worse. Just read. These people are predators, and they're gaining power. And why wouldn't they? With "free market" ideology a given, a known-good, and droughts as far as the next century mark, they're in a perfect position to do well, so long as they keep control of government, including Jerry Brown's government. Will Californians Let Their Government Give Water To the Wealthy or the People? So here's your other bottom line. Because until we get a true "national emergency" economy, and that economy is bent to serve the "rest of us" first instead of the rich, we won't have solutions to the first of a cascading list of problems. But don't lose heart; this isn't over. It's just that it's time for an "Easter Island solution" in which we depose the chief — meaning the masters of the "free" market, as explained here. The longer we wait, the worse the "best case" solution becomes. Government's gotta serve somebody. Is the time for asking politely finally over? We're actually in charge of that, if we want to be.